This guide to the designs, technologies and materials that really make green buildings work will help architects, specifiers and clients make informed choices, based on reliable technical information. Low Impact Building: Housing using Renewable Materials is about changing the way we build houses to reduce their 'carbon' footprint and to minimise environmental damage. One of the ways this can be done is by reducing the energy and environmental impact of the materials and resources used to construct buildings by choosing alternative products and systems. In particular, we need to recognise the potential for using natural and renewable construction materials as a way to reduce both carbon emissions but also build in a more benign and healthy way. This book is an account of some attempts to introduce this into mainstream house construction and the problems and obstacles that need to be overcome to gain wider acceptance of genuinely environmental construction methods. The book explores the nature of renewable materials in depth: where do they come from, what are they made of and how do they get into the construction supply chain? The difference between artisan and self-build materials like earth and straw, and more highly processed and manufactured products such as wood fibre insulation boards is explored. The author then gives an account of the Renewable House Programme in the UK explaining how it came about and how it was funded and managed by Government agencies. He analyses 12 case studies of projects from the Programme, setting out the design and methods of construction, buildability, environmental assessment tools used in the design, performance in terms of energy, air tightness, carbon footprint and post-occupancy issues. The policy context of energy and sustainability in the UK, Europe and the rest of the world is subjected to a critical examination to show how this affects the use of natural and renewable materials in the market for insulation and other construction materials. The debate over energy usage and embodied energy is discussed, as this is central to the reason why even many environmentally progressive people ignore the case for natural and renewable materials. 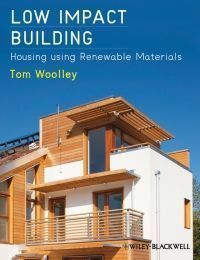 The book offers a discussion of building physics and science, considering energy performance, moisture, durability, health and similar issues. A critical evaluation of assessment, accreditation and labelling of materials and green buildings is central to this as well as a review of some of the key research in the field.